Mumbai, 26th November 2018: Rotary members across India are excited to host the Rotary President-elect Mark Maloney and his wife Gay on their four-day visit to the country. The couple, who arrived on 24th November 2018, have an action-packed itinerary which began with their visit to the Chhatrapati Shivaji Maharaj Vastu Sangrahalaya (CSMVS) Museum in Mumbai to officially inaugurate the Rotary Club of Bombay’s Initiation of the illumination of the Museum’s façade and lawns. Mr. Maloney and his wife were given a private tour of the Museum, and then were taken through the Green initiatives supported by the Rotary Club of Bombay that help reduce the CSMVS’s carbon footprint. Since 2015, the club has provided 48 photovoltaic rooftop panels, more than 100 solar panels, rain water harvesting and waste water treatment. 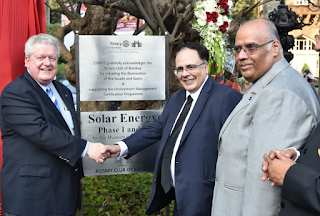 Employing sustainable practices such as the new Façade Lighting Project will not only enhance the museum’s view as heritage architecture but will also serve to protect the urban heritage of Mumbai city,” said Rtn Manoj Israni, a keen supporter of the project and a member of the Rotary Club of Bombay.